GIMP is a free image editing program that brags on offering many of the same features that Photoshop provides. Based on most comments I’ve received over the years, I’ve come to the conclusion that GIMP is actually nothing like Photoshop. Now, before I get any further, I’d like to share a few disclaimers. 1. I actually use a backdated version of GIMP, partly because I’ve been using the same program since I started iconning, and partly because the one time I did try an updated version I had a panic attack and ended up digging around in the archives to find my old version again. If you can find and download an older version (I use GIMP 2.6) you’ll probably have a much smoother, stress-free GIMP experience. 2. From what I can gather, Photoshop gives you more options when it comes to text effects, plus has handy filters that automatically apply them for you. Some of my tips and tricks might seem like a long way around to get the same basic look, but that’s because I’m using a cheap knockoff. Feel free to share about your process and typography hacks, but keep in mind that they might not translate the same way in GIMP as they would in Photoshop. First and foremost, you should understand the basic tools GIMP provides you with. + GIMP has access to any fonts that you have installed on your computer. You can certainly use the basic fonts that come pre-installed on your computer, but I would warn that because these are standard fonts, the results are probably going to look dated. There are tons of free to download fonts out there, and they take up very little of your computer’s space. You can also uninstall them later if you end up changing your mind, in fact, I do a font cleanse once a year. + My version of GIMP has several check boxes. 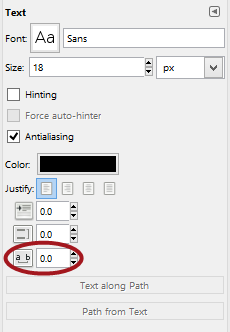 I keep the Antialiasing option checked, but turn off the Hinting and Force Auto-Hinter option. Why? There’s a mathematical computer-y reason behind this, but all you really need to know is that Antialiasing helps keep your text from looking pixilated, and the other settings will screw up the way your fonts look. + There are Text Along Path and Path From Text options in GIMP, but I never use them. This is mainly because I’m lazy. It’s also partly due to the nature of my simplistic approach to icon making in general. + One of the most important tricks you should know about when placing text is kerning. 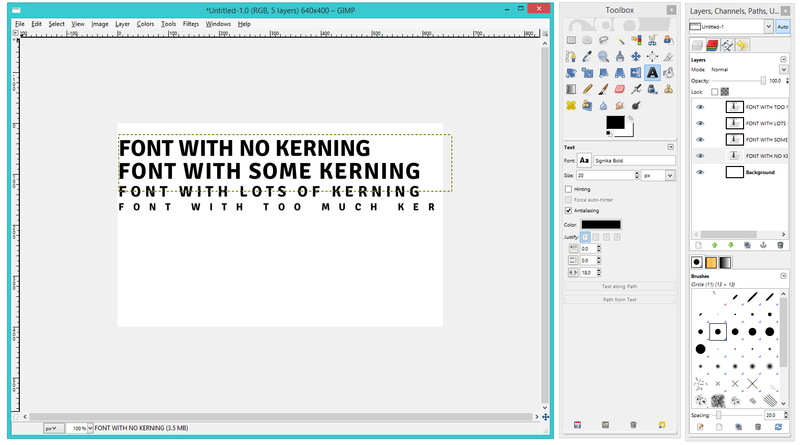 In GIMP they call it “letter spacing”. We’ll get into this more a little bit later, but be sure you locate this tool in GIMP because it’s a game changer. Based on my experience, here are some general guidelines that I (usually) follow. These aren’t hard and fast rules, but maybe they’ll help you out. + I work on a 300x300 pixel canvas. It’s a lot easier to see what I’m doing this way, and ensures that the text, textures, and other elements are balanced and blend together. I’ve also found that it sort of softens up the fonts when they get resized to 100x100 instead of looking harsh and disjointed against the rest of the icon. + I do not sharpen my icons AT ALL until after I’ve flattened and resized the image to 100x100. Again, I find that this creates a smoother end result. + When I’m done with my icon, I flatten it and then scale it down to 100x100. 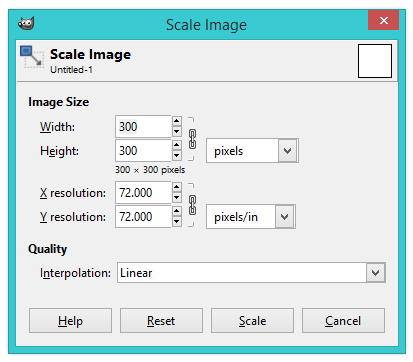 I change the Interpolation settings in the Scale Image window to Linear. I used to just leave it at whatever the default setting was, but since I changed it my icons got a lot less pixilated-looking. + I place text last, but plan for it first. There are two major reasons for this. 1) Text that has been added as an afterthought usually ends up looking like an afterthought. Good typography sort of flows with the rest of the design. Think of typography as just another form of composition. 2) In GIMP, it’s impossible to move multiple layers unless you flatten and merge them together. Because I tend to change my mind about subject placement, font size, colors, etc. during the process, it’s really frustrating to try and move multiple layers of text, so I just leave the text off until I’m satisfied with the rest of the icon and then add it last so I don’t have to move it more than necessary. I’ve gotten pretty good at eyeballing my space and picturing the results in my head, but if you’re not big on freestyling, I would recommend doodling the basic shapes onto a piece of paper. + That being said, the text is not always the last thing I do before flattening and resizing my icons. More and more I’ve been into adding extra lighting, textures, or even overlapping my subjects on top of the text so that it looks more like a part of the composition. These little details don’t take much time, but end up looking really complex and unique. + I’ve traditionally avoided very small text on my icons because I’ve had poor luck in getting it to look clean after being shrunk down to icon size. This is something I’ve been braver with recently, but you might have picked up on my sizing preferences if you’re really observant. + I don’t like to put large blocks of text or long quotes on my icons because it’s harder to plan for these, plus usually my typography involves having each word on its own layer (which, as I have mentioned before, becomes very difficult to move if I change up the composition later on). This is another area that I’ve been pushing myself to be braver, but laziness wins out most of the time. + Incorporating something in my icon that is meaningful to me on a personal level helps me to be more creative. If you’re taken with a phrase from a show, a motivational quote, or the lyrics from a really inspiring song, you can turn that into creative fuel for your next typography icon. It can also really help your icon be more relevant if the quote directly ties to the character or show, reflects their journey, or really jives with their body language. A common issue of text on icons is that the words become difficult to read, get messed up during the resizing stage, or disappear completely. The reasons for this vary, but I’ll try to troubleshoot the most obvious issues. + If the text is too small it can become tiny text, which is usually not my goal. You might be trying to pack too much text into your icon, or you didn’t allow enough space for your text when you cropped your image. Remember, you’re aiming for a balanced composition, so small is just fine as long as it looks good in context with the rest of the icon. + If your text is blurry, you might need to sharpen your icon more, or the free font you used is low quality. It’s easy to see if the edges of the font look crisp when you size it up to 200+ px. If it looks blurry once it’s supersized, you should probably pick a different font. + If the text is melting into the background too much there are a lot of ways you can try to fix it. Pick a different shade of the same color to help it stand out. Pick a different color that will provide a contrast to the main colors of your background. Add some extra shading behind the text to help it stand out with a black brush on Soft Light. 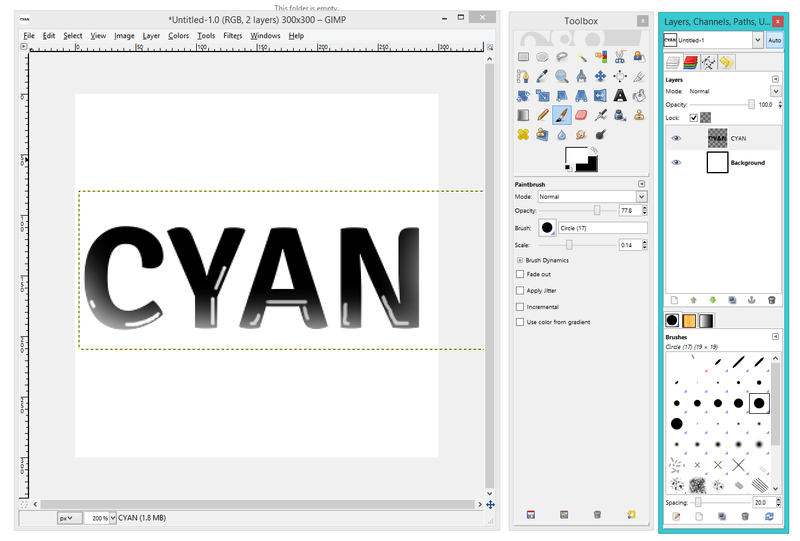 Create a faux drop shadow in GIMP by replicating the text layer, putting it on Multiply, and placing it slightly off to one side or diagonally. Erase busy textures that are directly behing the text to give it a solid base. Or, embrace the disappearing quality if it's working with the overall mood of the icon! + If your text is cropped or gets obscured by other elements, be sure to double-check that the sentence doesn’t get cut off at a strange place, or that you didn’t accidentally create a different word. + Picking a good font goes a long way for legibility and also the overall mood of the icon. I’m of the mind that a good, clean font is the safest bet (and fits all occasions). If you’re into fonts with more flair, be sure that you’re picking ones that go with the mood, era, or style of the rest of your icon so as to create a cohesive design. Put simply, kerning is the amount of space between each letter in a single word. If you learn one thing from this post, you should probably learn about kerning. + GIMP’s Text Tool has a Letter Spacing button that allows you to type a number into a little box. This is how you adjust your kerning. + I like to think of kerning as giving your letters some breathing room. A little bit goes a long way to making your typography more tidy and legible. If you’ve been manually putting spaces between each letter (guilty) then your life just got a little bit better. If you’ve never even thought about putting extra space between letters, then keep reading to learn some of the benefits. + Kerning is best used on structured fonts. Handwriting and script fonts are already pretty loose and flowy, so they don’t usually need the extra breathing room. + Kerning can break up blocky, heavy fonts so that you can keep your flowy negative space without needing to use willowy, narrow, handwriting fonts all of the time. + You don’t have to use the same amount of kerning on every single word. This can help different words carry more weight, or allow you to use the same font and get a totally different look. +You can also use negative numbers to tighten up fonts. I don’t do this regularly, but it can come in handy for special effects or fonts that have too much space built in by their maker. + Be warned, too much kerning is just as bad as no kerning. In the same way that it can make text easier to read, it can make text harder to read if you go overboard. It doesn’t always have to be obvious that you’ve used kerning. Try instead to focus on what works within your icon’s composition. Here are some tips that are life savers when working on text layers with GIMP. + A technique I use a lot for my icons is to put text layers on Overlay instead of trying to get the lighting/effects to match up with the background myself. If the text blends with the background too much, I duplicate the layer and mess with the Opacity until I hit on something I like. + For most text effects, I rely on the Lock feature on the Layers sidebar (this is what it looks like). Once I’m satisfied with the general placement and color, I can Lock it and then paint over the text with a brush, or sometimes I’ll use the eraser tool (at a really low Opacity) to help the text blend with the background. + I use the rotate tool a lot when placing my typography. Even a very slight angle can help provide some much-needed movement to the finished icon. + I would highly recommend keeping each line of text on its own layer instead of trying to adjust the spacing between lines to suit. You’ll have more control of the placement if you handle it manually. You can also play with varied font sizes, which will help make your typography look more polished. + When working with a long quote or other larger block of text, start with the key words that are going to anchor the phrase and stand out more on your icon. Leave smaller phrases that link those parts until last. This will help you highlight the important parts of the icon and the important parts of the quote simultaneously. It also minimizes the amount of time you’ll spend shuffling different text layers around on the canvas. + Keep trying. You learn best from your mistakes and growing familiar with your tools. GIMP might not be the easiest program to work with, but you can still be creative and make beautiful icons. + Learn from others. A big part of developing your typography style is training your eyes to look for things that you like about other people’s typography. It’s also never a bad thing to just go up and ask! This is a creative community, and everyone I’ve ever asked has been happy to share about their process. 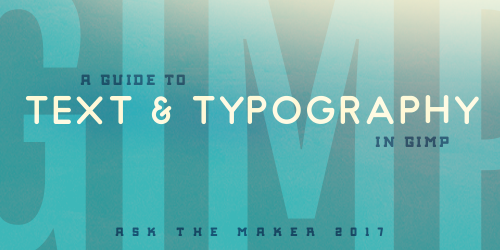 + What are your favorite typography hacks? + Which text-heavy icons inspire you the most? + What are your favorite fonts? + Did you try something new? Let me see! Have more questions? Check out my thread!